This entry was posted in News, Research and tagged Freshwater Resilience, Mission, Tanzania, World Bank on October 16, 2017 by hydrosystems. In this final post on the series Economic Allocation of Groundwater, we’ll evaluate the tradeoff between economic gains and environmental performance in the Frenchman Creek Basin. How is environmental performance related to economic gains in the context of groundwater pumping? In the Frenchman Creek Basin, as with many other basins, streams are hydrologically connected to the groundwater. What that means is that flow in many streams and rivers is supplemented by groundwater (known as baseflow). With increased groundwater pumping, the groundwater level goes down, and reduces the amount of ‘baseflow’ in the rivers. The figure below shows the tradeoff for three different types of groundwater management policies. Here, our metric for environmental performance is streamflow violation percentage, which is simply the percentage of occurrence when modeled streamflow is less than the streamflow targets at specific ecologically sensitive locations across the basin. The y-axis shows the streamflow violation percentage, while the x-axis represents the combined annual farmer profit. The black dot (in the top-right corner of the figure) shows the tradeoff when there is no management policy; every farmer is free to pump as much groundwater as he/she desires (let’s call it the free access policy). While the free access policy results in the highest economic benefits it also results in the least environmentally sustainable outcome. This is because in the absence of groundwater management, farmers act in their own interests to maximize their profits. The ‘costs’ of environmental degradation are socialized with groundwater. Since farmers don’t directly experience these costs, there is no incentive to use groundwater ‘sustainably’ if there are no regulations on groundwater use. In a free access system, these environmental costs accumulate over time and affect all groundwater users in the region (analogous to the concept of externalities). Allowing trading between agents leads to a lower streamflow violation for a given level of societal benefits because as the price of groundwater increases, less efficient farmers reduce their water usage and sell their permits to the more efficient farmers. Since now a greater proportion of water is being used by the more productive water users, crop production per unit of water used increases. So for a given level of water use, trading of water permits leads to lower environmental damages. 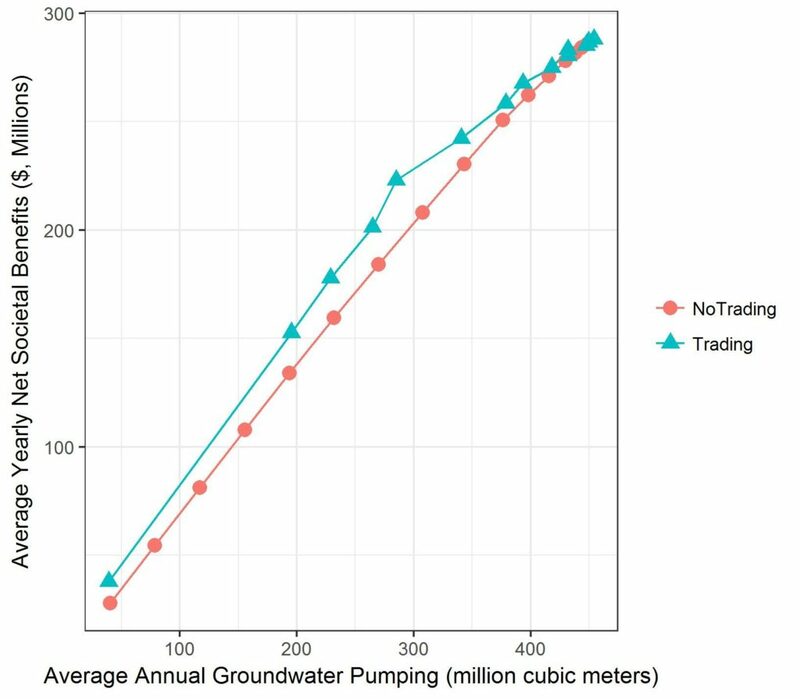 Increasing streamflow violations indicate a falling groundwater table resulting in higher cost of pumping groundwater. That raises the question: shouldn’t the higher pumping costs eventually force farmers to reduce their pumping? In this case, the answer is no. Because the pumping costs are low relative to the benefits of pumping, declining groundwater levels don’t impede depletion. Hassaan F. Khan is a PhD Candidate in the Hydrosystems Research Group. You can find him on Twitter @hasfkhan. This entry was posted in News, Research and tagged Allocation of water, Cap and Trade, Economic modeling, Groundwater on February 13, 2017 by hydrosystems. 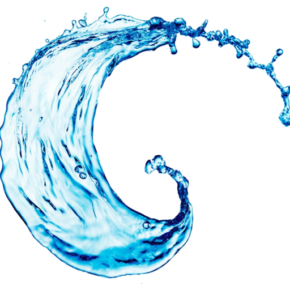 The underlying premise of a water market is that the price of water can be used to indirectly ‘control’ the quantity of water used, or vice versa. Price and quantity have an inverse relationship so that when the available groundwater gets scarcer, the price of water increases. At a higher price of water, some farmers may find that the benefits of selling water are higher than what they would obtain if they used that water to grow crops to sell. This is especially true for inefficient farmers. For efficient farmers who are able to produce a higher yield of crops for a given water usage, buying water allows them to increase their crop production and associate revenues. When enough of these trades happen on a system level, overall system-wide profits for a given volume of water used increase. We put this theory to the test in the Frenchman Creek Basin using our modeling framework (described in Part 2). In the figure below, we can see the potential benefits of allowing farmers to trade their groundwater allocations. Let me walk you through this graph. As one would expect, when the total groundwater pumping increases, that results in greater economic benefit (farmers have more water to pump, and can grow more crops). The red line shows the economic benefits when agents are provided a uniform allocation and not allowed to exceed that (i.e. quotas on groundwater use). 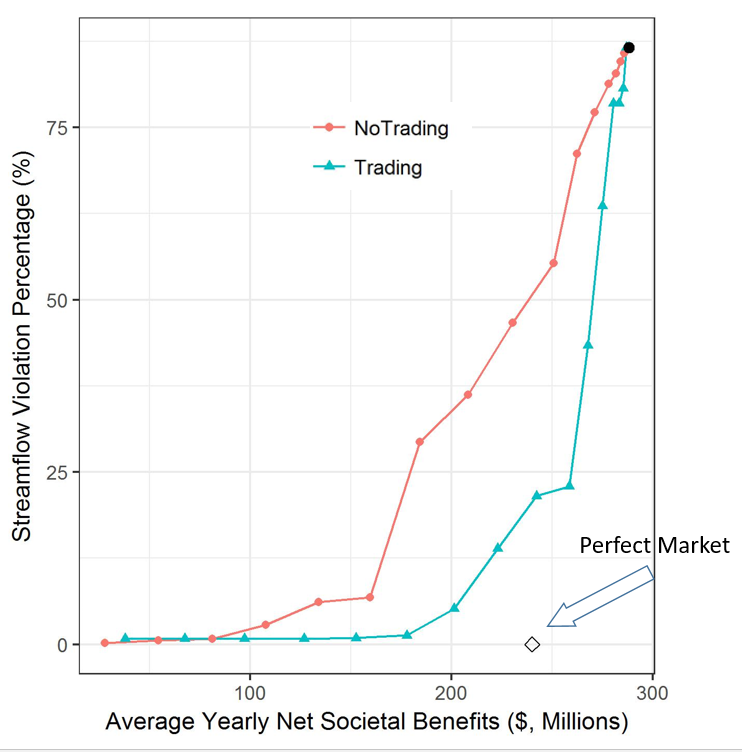 The blue line represents the benefits received when the agents are allowed to trade their allocations. The difference between the red line and the blue line is the change in benefits when farmers are allowed to trade their groundwater allocations. While the red line is linear, the blue line is slightly concave. This suggests that the gains from trading are highest when the initial allocations aren’t extreme, aren’t too low or too high. These initial results seem to suggest that in the Frenchman Creek Basin, with the right price of water and, trading of pumping allocations can increase revenues by up to $20 million (~10% of total revenues). While this may seem like a relatively big amount. It is important to note, that currently these results don’t include the costs associated with setting up markets (transaction and transformation costs). To make an effective case for the establishment of a groundwater market, the benefits need to be greater than the costs. We’ll discuss these costs and the effect of incorporating them in our models in the coming blogs. This entry was posted in News, Research and tagged Allocation of water, Cap and Trade, Economic modeling, Groundwater on February 6, 2017 by hydrosystems. The debate between the free market and the “planned” (aka command and control) approach to governance is an old one. Recently, with the emergence of ‘water markets’, it has become relevant in the context of water resources management. In my current research, I am assessing the relative performances of these two approaches for groundwater management, in terms of the tradeoff between economic benefit and environmental degradation. For our purposes, we define water markets as a system of formal rules and regulations that govern the buying, selling and leasing of water use rights, traded independent of land titles. Previous research1 has shown that optimal water markets (i.e. incentives-based policy) outperforms the command and control approach to groundwater management with regards to both economic and environmental outcomes. An optimal water market assumes perfect knowledge of hydrology, and optimizes the water use on a system-wide level to achieve maximum economic benefits. In reality, however, perfection is hard to achieve. In my research, I’m interested to know how realistic water markets perform compared to uniform water quotas. We want to see whether the advantages of a water market over water quotas hold when there is no central planner with perfect foresight of the future and each farmer acts in his or her own interest. Here is a quick overview of our modeling framework. In the farmer decision model, each “agent” represents a farmer/group of farmers, with varying levels of water productivity and land size. We have 50 agents in total who buy and sell groundwater permits with each other. The farmers can grow either crop or soy. At the start of the growing season, each of these agents makes a decision based on the land and water constraints on how much water to pump. The farmer decision model is connected to the physically based groundwater model that evaluates the impact of human actions on the natural system. We use a calibrated MODFLOW model developed by the Republican River Compact Authority, which operates on a monthly time step. It incorporates streamflow, precipitation and evaporation recharge and provides head of groundwater in response to groundwater pumping. We use the Frenchman Creek Basin, a sub-watershed of Republican River spanning the states of Colorado and Nebraska, as a case study. This area is part of the Ogallala aquifer and has seen a tremendous increase in groundwater pumping in recent years. This has led to a dramatic water decline leading to states implementing regulations on groundwater withdrawals, including implementing groundwater quotas (a command and control approach). We want to know whether there is a better approach to ensure sustainable groundwater use. In the next post, I’ll share some results from our analysis of the performance of groundwater markets. Stay tuned! This entry was posted in News, Research and tagged Allocation of water, Cap and Trade, Economic modeling, Groundwater on January 30, 2017 by hydrosystems. From Bolivia to Cambodia to California, droughts and water shortages made headlines in 2016. 2017 promises to be no different. It’s important to understand the true nature of today’s water challenges. Fundamentally, the problem isn’t that all of a sudden we’re running out of freshwater. True, water demand is rising with increasing populations but there’s enough of it to meet both current and projected human needs. The underlying reason behind these ‘water crises’ is that water availability is mismatched in space and time, i.e. most of the time, most of the water isn’t where most of the people need it1. Over the past few decades, as surface water resources have become increasingly stressed, people around the world have turned to groundwater. And that has to a large extent, up till now, mitigated much of the water stress faced globally. However, in recent years, harmful impacts of unmanaged groundwater have emerged. 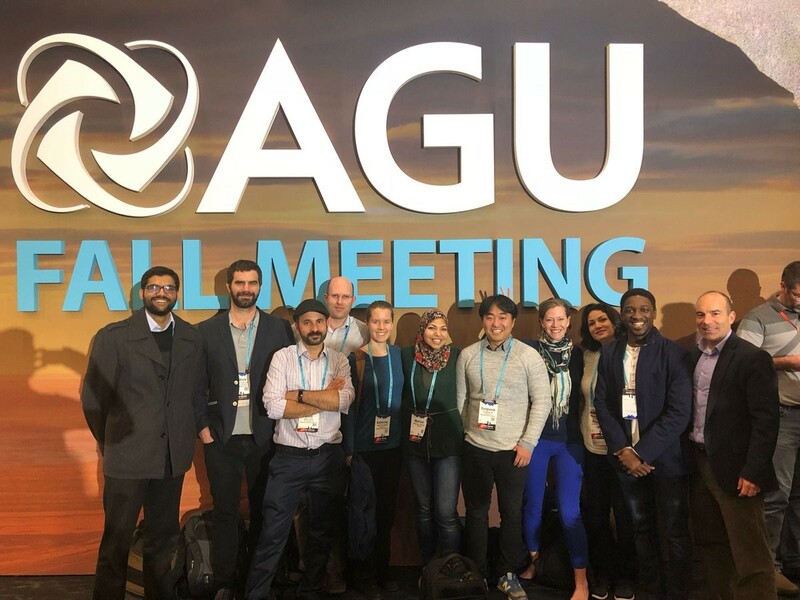 A recent study using GRACE satellite data showed that 24 of the 37 largest aquifers globally were rapidly depleting due to unsustainable pumping levels2. A big chunk of this groundwater usage is in agriculture, which accounts for 70% of global water use. Within agriculture, almost half of consumptive use is through groundwater3. So it’s imperative that we manage our groundwater better, and the logical place to start is with groundwater used for irrigation. When it comes to resource management, there are two broad categories of options: a command and control approach and an incentive based approach. Command and control refers to a centralized more ‘authoritarian’ type of approach. Examples of these policies include water use quotas, mandating efficient technology standard etc. incentive based approaches make use of economic forces to ‘encourage’ efficient usage, for instance through cap-and-trade systems, taxes and subsidies. In the next series of posts, I’ll discuss some of my recent work evaluating the incentive based policies for groundwater management using a coupled human-natural system model. Debaere, P. et al., 2014. Water markets as a response to scarcity. Water Policy, 16(4), p.625. Richey, A.S. et al., 2015. Quantifying renewable groundwater stress with GRACE. Water Resources Research. Siebert, S. et al., 2010. 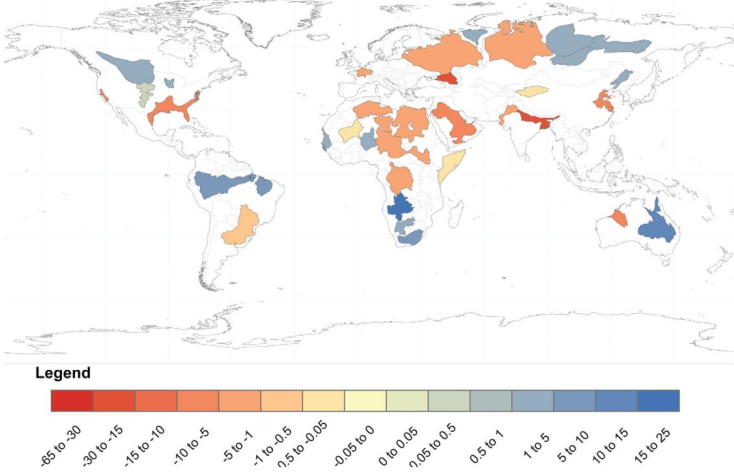 Groundwater use for irrigation – A global inventory. Hydrology and Earth System Sciences, 14(10), pp.1863–1880. This entry was posted in News, Research and tagged Allocation of water, Cap and Trade, Economic modeling, Groundwater on January 23, 2017 by hydrosystems.